Earlier this month we posted Melt Banana‘s cover of Queen’s ‘We Will Rock You‘. Listen to that here. Melt Banana seem to like the occasional cover (who doesn’t?) and we’ve found Banana-fied versions of songs from Devo, The Damned, The Beach Boys and even Bing Crosby with, you guessed it, White Christmas. But up for your delectation now is their spectacular version of Kraftwerk’s ‘Showroom Dummies‘ off the Krautrockers’ Trans-Europe Express album, see track below. 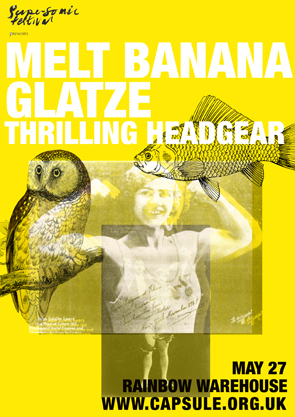 Glatze – Glatze is all about attention grabbing, energetic live performances so draws influences from the likes of Henry Rollins, Afrirampo, rave DJs such as Sy and Slipmatt, and of course Melt Banana! Glatze is Sam Underwood‘s alter ego. Thrilling Headgear – Thrilling Headgear is all about libidinous acts of creation, getting hyped off of hype stoked off of stoke. Features current/ex- members of Stinky Wizzleteat and Opium Lord. Buy Advance Tickets, cheaper than on the door! That’s extra pennies to spend on merch!